Greetings, fellow Americans. Karl Rove here. Are you one of the downtrodden folk who have never had a lucky break? I was one too, but I am going to pass on to you how you can break out of that bad luck cycle with my new book, Weaseling Your Way To Success! 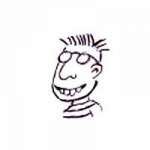 As a child I was unattractive, unpopular and as dorky as Popeye going through spinach withdrawals. But I powered through all that to the very top echelons of our society. This book, which has become a top seller on the Neo-Nazi learn-to-read program, will show you all the conniving tricks you need to know to claw your way to the top by undermining everyone else. How To Get Selfish Personal, Partisan And Corporate Legislation To Look Like It Is Patriotic And Good For The Whole Country. 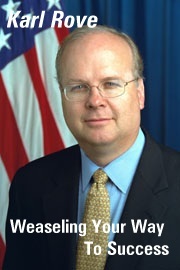 Remember, to be successful the Karl Rove way, use the key word: L-I-E-S. I = Intelligent reorientation of the truth. S = Spice up the story. To get ahead of the game as a far right wing idealist, one cannot be tripping over such things as ‘having a conscience’ or ‘being moral.’ ‘Being moral’ is something we’ll leave to the preachers to preach to keep the masses under control. One very important thing to remember — keep yourself in the background as much as possible. You can’t be a good weasel if everyone sees what you are doing! Be sure to buy my book now! I can never have enough money or compliant followers! As It Turns Out, the Female Body DOES Have a Way to Shut the Whole Thing Down!